While we’ve been enjoying the summer in the southern hemisphere, we’ve also had a monster couple of months in terms of sales at Yellowfin. We had a great December and closed off the calendar year very strongly. While early January is always quiet as everyone shuts down, we came back firing on all cylinders and have closed one of our biggest months, if not the biggest ever, in terms of sales. To deliver this result, the sales team has done a fantastic job all round. An important part of that result was a deal that we won with the City of Ann Arbor in Michigan. We were up against ThoughtSpot and DOMO, but we successfully closed the deal and are looking forward to working with the team at Ann Arbor. This deal reflects the great job our sales team has done in the local government space, an area that we’re rapidly gaining traction in. We also spent January working through our organizational strategy for the next 12 months. While much of the focus has been on expansion and go to market strategies, a significant part of this process was also revisiting our brand positioning and logo. Over the past 18 months our business and product have continued to evolve. We’ve hired some fantastic people that have moved our organization forward dramatically and we’re now a substantial global organization. We’ve added new features like automated insights and data discovery, and there’s more to come in our product roadmap, taking us in a new and exciting direction. So when we looked at our brand positioning we realized that the Yellowfin of the past didn’t really reflect who we were today and what we wanted to be in the future. Our organization had refreshed and evolved and it’s now time to give new energy to our brand. 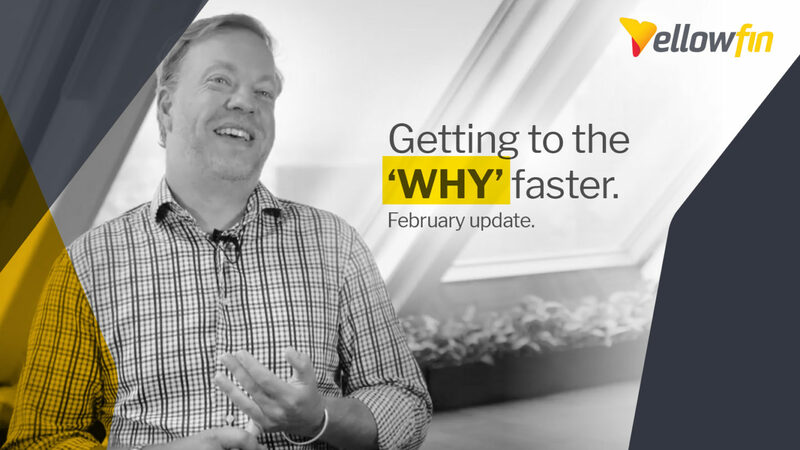 Today, Yellowfin is about getting to the ‘why’ faster. The ‘why’ is central to our product and we wanted it to be core to our brand as well. We help our customers deliver insights faster and shorten their time to value. So as part of our rebranding we’ve emphasised the ‘Y’ while retaining the Yellowfin name and font as core to our logo. The new brand is now being rolled out – you can already see it on our website – and it looks great. The project was led internally by Chris Benham and Mylo Norman who have done a fantastic job. We also recently hired Keith Bold as our new CFO. Coming from Dion Global Solutions and Attachmate, he has solid experience in software and software sales. He has even led a sales organization in the past, which is going to be great for forecasting and predictability in our sales function. We’re really looking forward to having him on board. With great sales results to start the year, Keith bringing a new perspective and our new brand in the market, we’re all set for a great year ahead.